Yellow Water Lily Pads, can be found in shallow wetlands across Europe, northern Africa, and Asia. Like its cousins, the yellow water lily roots itself in freshwater sediments while its leaves float on the water's surface. The plant can grow to depths up to 16 feet. The yellow flower that gives the lily its name consists of 5 or 6 yellow sepals, concealing smaller, yellow petals. The bud gives way, each fall, to a green, bottle-shaped fruit. The lily requires more space and depth than the water features of a home garden but makes a great addition to larger ponds and lakes. Yellow Water Lily Pad are beautiful to add to those magnificent water gardens. They will grow well in water and will bring a lot of life to a water garden. They will become and thrive in water and bog areas. They also do well in containers that will supply plenty of water. These are beautiful with their yellow blooms. These plants can also bloom in pink and white. They are sturdy and hardy plants and are very hard to get rid of once they get established and grow well.The lotus is an aquatic plant that grows in ponds, lakes and other areas of standing water. Its roots anchor into the lake bed while its leaves and flowers rest on the water’s surface or near the surface of the water. It produces elegant flowers of white, pink and somewhat purple coloration and its leaves stretch themselves out comfortably on the water’s surface giving a relaxed feeling to the garden. Yellow Water Lily Pad is a vigorous grower, especially when planted in areas of full sun. It can grow on its own, but it can be helpful to fertilize occasionally. Few people know that an individual lotus plant can live for over one thousand years because it can revive itself after entering a period of stasis in drought conditions. 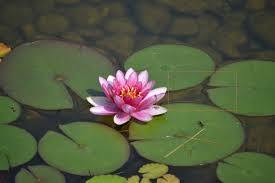 Lotus is one of the first plants gardeners consider when planning a water garden. Yellow Water Lily Pad is well known for its calming beauty.